Christianity101: Alcohol - Liquid Devil! Booze Kills! Steals! and Destroys! Booze is a ROAD to Hell! Alcohol IS A DRUG!!! It affects the entire body. Actually, a driver can be impaired with a U.S. blood-alcohol level as low as .03. When you drink alcohol, it goes straight from the stomach to the bloodstream. Alcohol can be detected in the blood as fast as five minutes after drinking, and it's effects — most obvious in the central nervous system — peak in about 30 to 45 minutes. Alcohol depresses the central nervous system which, in turn, impairs motor function, motor performance, speech and eye movements. These skills are not only slowed down, they are performed more inaccurately. Alcohol also affects the ability to think and reason clearly. This is prime opportunity for Satan to sift you as wheat ... Jesus warned Peter in Luke 22:31, "...behold, Satan hath desired to have you, that he may sift you as wheat." The Devil wants to kill, steal, and destroy your life (John 10:10) —why make it easier for him by drinking booze? Truly, consuming beer is risky business. 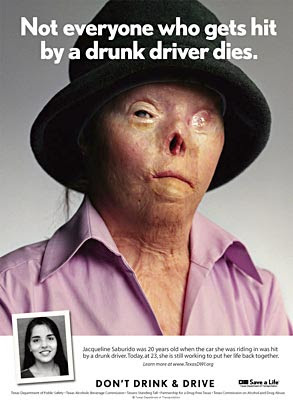 Alcohol is a much bigger problem than the beer companies and beer drinkers would like for us to think. There's an untold story. 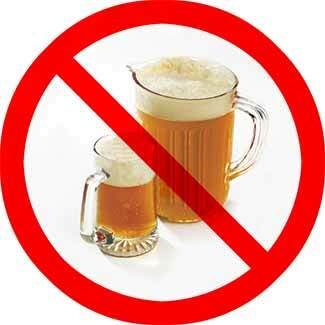 Every year, millions of people are victimized, one way or another, by alcoholic beverages. Children especially, are hurt because of booze. Social drinking is not the solution to the problem of alcoholism. Rather the social glass is the starting point of the majority of alcoholics. If legal age barriers are eliminated in the sale of alcoholic beverages, and boys and girls are encouraged to drink in the homes, in society, and at church sponsored functions, what would be the result ? 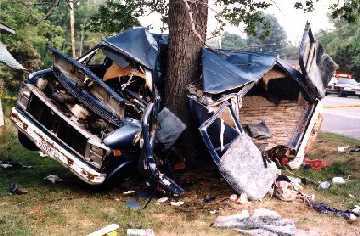 There would be increased slaughter on our highways due to drunken driving including that of teenage drivers. The national crime bill, already the highest on record, will be greatly increased. As strong drink destroys the mind and body and removes all moral inhibitions, the nation would be further weakened to subversive forces boring from within. The rich owners of huge liquor monopolies and big investors will become richer still as families are reduced to abject poverty, and youth winds up in a gutter. Increased drunkenness is one of the given signs of the last days: "But ye, brethren, are not in darkness, that that day should overtake you as a thief... Therefore let us not sleep, as do others, but let us watch and be sober. For they that sleep sleep in the night; and they that be drunken are drunken in the night. But let us, who are of the day be sober... For God hath not appointed us to wrath, but to obtain salvation by our Lord Jesus Christ" (1st Thessalonians 5:4-9). In view of His sudden return, Jesus specifically warned Christians, saying "Take heed to yourselves, lest at any time your hearts be overcharged with surfeiting, and drunkenness, and cares of this life, and so that day come upon you unawares" (Luke21:34). But sad to say, many do not heed this warning. Likewise there are ministers today, who, like the householder in Jesus' parable, have said in their hearts, "My Lord delayeth His coming," and are now engaged in smiting their fellowservants and eating and drinking with the drunken. Upon such, the Lord will come in an hour when they think not, and shall appoint their portion with the hypocrites where "...there shall be weeping and gnashing of teeth (Matthew 24.51). YOU'D BETTER THINK ABOUT THAT BEFORE YOU TAKE THAT "OCCASIONAL" DRINK! You've heard it said, one or two drinks won't hurt you, or an occasional drink may even be good for your health. An article in U.S. News and World Report states, 'Alcohol begins to alter the functioning of virtually every organ from the moment it enters the body...experts believe even OCCASIONAL DRINKS CAN BE DANGEROUS.' According to studies, you have at least a 1 in 10 chance of becoming an alcoholic with each sip! Research states, "Everytime you take a drink you are playing RUSSIAN ROULETTE! Any given 'sip' you may pull the switch that will change your metabolism and turn you into a chronic alcoholic and destroy your life." And 1 out of every 10 alcoholics commit suicide! You'd better think about that before you take that 'OCCASIONAL' DRINK! Once again, the Bible gives a perfect description of alcohol in Proverbs 23:"Who hath WOE? Who hath SORROW? who hath contentions? who hath babbling? who hath wounds without cause? who hath redness of eyes? THEY THAT TARRY LONG AT THE WINE; they that go to seek mixed wine. Look not thou upon the wine when it is red, when it giveth his colour in the cup, when it moveth itself aright. At the last it BITETH LIKE A SERPENT, AND STINGETH LIKE AN ADDER. Thine eyes shall behold strange women, and thine heart shall utter perverse things." The Bible says, ". . . at last it biteth like A SERPENT." Do you know what a serpent bite is? POISON! Did you know that alcohol is poison? Every major organ in your body is poisoned by alcohol. According to The Birmingham News (Nov. 19, 1990), "Scientific data show alcohol is THE MOST PHYSICALLY DETERIORATING drug there is. It causes more organic damage than any other drug. . ."Why is it when people get drunk, they have a tendency to vomit? Because your stomach knows POISON when it comes down! No wonder the bartender says, "NAME YOUR POISON"! When a man is drunk, he is INTOXICATED. Do you know what a TOXIC is? IT IS A POISON! A drunk man is a man who has LITERALLY POISONED HIMSELF! Scientists have only recently discovered the physical process that creates the slurred speech and drunken stupor. Once in the blood stream, alcohol causes a coagulation of the red corpuscles referred to as "sludging". The blood thickens so that it cannot flow freely and clogs the metabolic exchange of life-giving oxygen. And when cells are deprived of oxygen - THEY DIE! And because brain cells require a high oxygen supply continuously, they are particularly vulnerable! And brain cells are the only cells that do not reproduce! Brain cells destroyed are never replaced! Autopsies performed on drinkers, often reveal hollow cavities in the skull, where ENTIRE CONVOLUTIONS OF THE BRAIN HAVE DISAPPEARED! And according to studies by Dr. Melvin H. Kinsley, brain damage occurs progressively from THE VERY FIRST DRINK! The next time you see that man staggering drunk - YOU ARE WATCHING A MAN LITERALLY DESTROYING HIS BRAIN! I've had people tell me several times, Jesus drank wine. . . The Bible makes a clear distinction between fermented liquor and new wine, or grape juice. Speaking of fermented liquor, Proverbs 23 says, "Look not thou upon the wine when it is red (speaking of fermentation), when it giveth his colour in the cup, when it moveth itself aright (speaking of the bubbling and carbonation). At the last it BITETH like a serpent, and STINGETH like an adder." A description of new wine is found in Isaiah 65:8, "as the NEW WINE is found IN THE CLUSTER." Not in a bottle! You can't get FERMENTED LIQUOR from a CLUSTER! Fermented LIQUOR is placed in a bottle, with yeast and allowed to FERMENT. Genesis 40:11 gives a clear picture of new wine, "I took GRAPES and PRESSED them in Pharaoh's cup." People say, Jesus drank wine at the Last Supper with the apostles. HE DID? In Matthew, Mark and Luke where the account of the Last Supper is found, the word "wine" is never even mentioned. The Bible very carefully says they drank - "FRUIT OF THE VINE!" What about when Jesus turned the water into wine at the marriage in Cana. If Jesus Christ turned water into fermented liquor, he directly disobeyed Habakkuk 2:15, "Woe unto him that giveth his neighbour drink, that puttest thy bottle to him, and makest him drunken also . . ." And, if Jesus disobeyed Habakkuk - HE WAS A SINNER! The Bible makes it very clear in 1 Peter 2:22, 2 Corinthians 5:21, and other verses - THAT JESUS CHRIST WAS WITHOUT SIN! God has placed a very strong warning in 1 Corinthians 6:9-10, "Be not deceived: NO DRUNKARDS, . . . shall inherit the kingdom of God." Beer is 100% LIQUID DEVIL! In Revelation 21:8, the word "sorcerers" is translated from the Greek "pharmakeus," which means "a drug, i.e. a spell-giving potion; a druggist (pharmacist) or poisoner." Interestingly, the modern word "pharmacy" comes from the SAME Greek root word as does the word "sorcerer." Thus, there has always been a direct connection between demonic possession and substance abuse. People throughout history who have entered the occult have abused alcohol and drugs to increase their levels of occultic consciousness. The taking of alcohol or drugs is absolutely essential to the practice of witchcraft and Satanism. Drinking alcohol opens demonic doors because a weak mind is the Devil's workshop. To come under the influence of alcohol is to LOSE one's capacity for reason and control. Many rock-n-roll performers have openly admitted to writing some of their music while high on illegal-drugs. Friend, alcohol will never satisfy that unquenchable thirst, burning inside of you. ONLY JESUS CHRIST CAN QUENCH THAT THIRST! Jesus said in John 7:37,"IF ANY MAN THIRST, let him come unto me, and drink." John 4:14 says, "But whosoever drinketh of the water that I shall give him SHALL NEVER THIRST; but the water that I shall give him shall be in him a well of water springing up into everlasting life." Why don't you let the Lord Jesus Christ satisfy that thirst in your soul today? OH, HOW HE LOVES YOU! He's been waiting for you a long time, friend. Why don't you trust him this very minute? You'll never regret it! You may not have a drinking problem. But, if you've never trusted Jesus Christ, there's a unsatisfied thirst and longing in your soul - and YOU KNOW IT! The Bible says in Proverbs 27:20, ". . . the eyes of man are never satisfied."